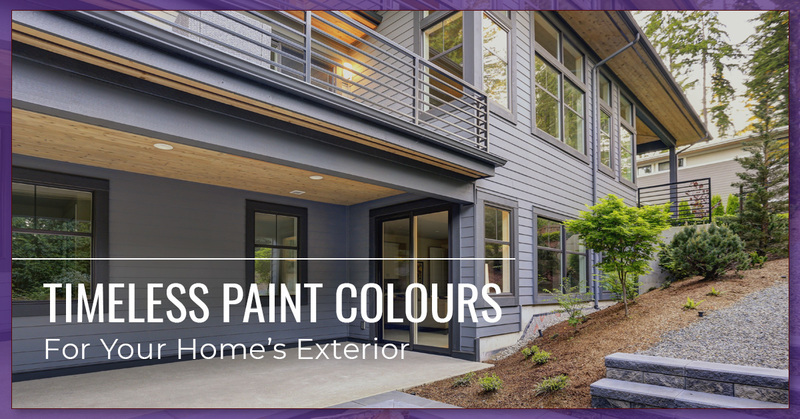 Picking a paint colour for your home’s exterior may seem like a difficult task. It can be stressful to settle on the right colour, since it’ll likely be on your home for years on end — and you certainly don’t want to end up with a colour that you’ll regret. So how do you decide on a colour that you’re sure to find welcoming as you approach your home day in and day out? Well, here at Integrity Painting, we’ve found that there are a few tried and true colours that have stood the test of time. Here are a few of our favorite paint colours, colours that you surely won’t regret if you can’t settle on the right swatch for your home paint. Blue-grey looks both inviting and unassuming. It’s a fantastic colour for homes with wood and vinyl siding, and it works well with asphalt and shingle-roofed homes. You can pair blue-grey with an off-white trim to give your home’s elements a quiet, but noticeable accent. Also, you can get creative with the colour of your door and other decorative features of your home’s exterior. Consider painting your front door a potent eggplant purple to compliment the blue-grey exterior of your home. Or if you’re feeling even bolder, you can go with a barn red coat of paint on your front door, providing some contrast against the blue-grey paint, and giving your home a strong focal point. Yellows are happy, highly welcoming colours, and they work great for small homes. While you might not want to use yellow on a mansion — which can overwhelm onlookers and those who are passing by — yellow is a fantastic colour for small abodes and townhomes. Like the blue-grey colour we just mentioned, you can get away with a bold colour for your front door and home accents, including that barn red colour. Yellows also look great with a little extra pop provided by white trim and accents. Red is striking and visually appealing for more rustic homes. If you have a barn-style home or a home with wood siding, you can opt for a red colour to coat your house. Also, consider a red home if you have an expansive patio to break up the composition, or if you have stone walls and chimneys to give your eyes something to look at amidst that powerful red. Most folks stick to a true red colour over light and dark reds, which are less traditional. Pair red with off-white trim to really tie together your abode with that farmland look. 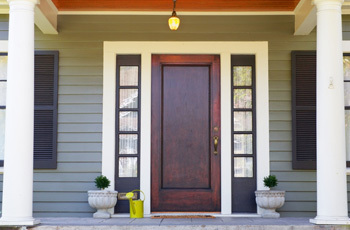 You can opt for a charcoal grey door, or leave your door with a natural finish if you have a natural wood front door. If you’re going with a red paint, you’ll also love how plants look that abut your home. You’ll love the look of vines climbing along the red facade of your abode. Off-white homes are highly popular because they always work. You really can’t go wrong with an off-white, and it’s a popular colour for simple, modern homes. You can even whitewash the brick exterior of your home (if you have a brick home). If you have trim accenting the features of your home, you can opt for a modest neutral tone, or you can get creative with a colourful trim paint (perhaps light blue or pale green). Just don’t go too overboard on the boldness of your trim, since it will quickly draw the eye away from the off-white colour of your home. Light blues look innocent and welcoming, and they’re an excellent option for small- to medium-sized homes. Light blue homes can be paired with many of the same colours that we mentioned in the blue-grey section above, including vibrant red front doors, as well as off-white trim. Also, you can consider dark and pale blue accents around your home, from the window shutters to the outdoor furniture sitting on the patio of your property. Neutral tans and greys are a safe bet for homeowners that want to ensure they’ll retain value in their home. These homes are quiet, yet they simply look great, no matter the siding material or roofing material of your home. If you really can’t decide on a tone and hue for your home, then take a look at tan and grey swatches. You can still go with an off-white trim to make your home well-balanced, and you can get creative with the accent colours of your house. Green-grey is especially good looking for homes that are surrounded by forests and foliage. If your home is well-planted in its landscape, then green-grey will further anchor your home on your property. You might pair this naturally beautiful colour with grey or off-white trim, or you can opt for dark blues or even brown accents if you’d like. A quiet green-grey will also make everything in your landscape pop, so be sure to plant some bright annuals and perennials to show off the splendor of your land! If you have a home that has a stucco facade, then you may even have more curiosity about what color will look best on your abode. Traditionally speaking, most stucco homes are tan. Think about stucco homes that you see in the desert — they’re often coated in a light tan color, or even a color that mimics the surface of the ground. However, the options don’t end there. Next, think about stucco homes that sit atop waterside cliffs (like those you’ll find in Greece). Here, white is acceptable, and you’ll even find bold blue colors. But what about if your home is in our hometown of Winnipeg. Here in Canada, folks love the look of neutral tones and tans for their stucco homes. These tones compliment the quiet nature of the stucco. In addition, you can consider the green-grey and pale blue that we mentioned above, as these colors look great regardless of the season, and they work well when surrounded by forests and foliage. Well, what are you waiting for?! We hope that our exterior painting ideas have given you the inspiration to take on your next painting project. And when you’re ready to get started, we’ll be here to provide you with a free estimate for the job. Also, if you are still uncertain about the best paint colour for your home’s exterior, we even offer colour consultations — so you can rest assured that you’ll love the look of your home for years to come! Just reach out to us if you need help! We provide both interior and exterior painting services for folks throughout Winnipeg.